This time of year is such a busy time of year- with testing, end of the year preparations, and much more. Bring some fun into it with some Easter themed teaching ideas! While some Easter activities can be difficult to plan in school, these secular spring teaching ideas are ready to go and will have your students learning and celebrating at the same time. Check out these Easter teaching ideas kids will love! This post may contain affiliate links. See disclaimer. Bring Out the Jelly Beans with these fun Easter Teaching Ideas! When it comes to Easter candy, jelly beans are a kid and adult favorite! 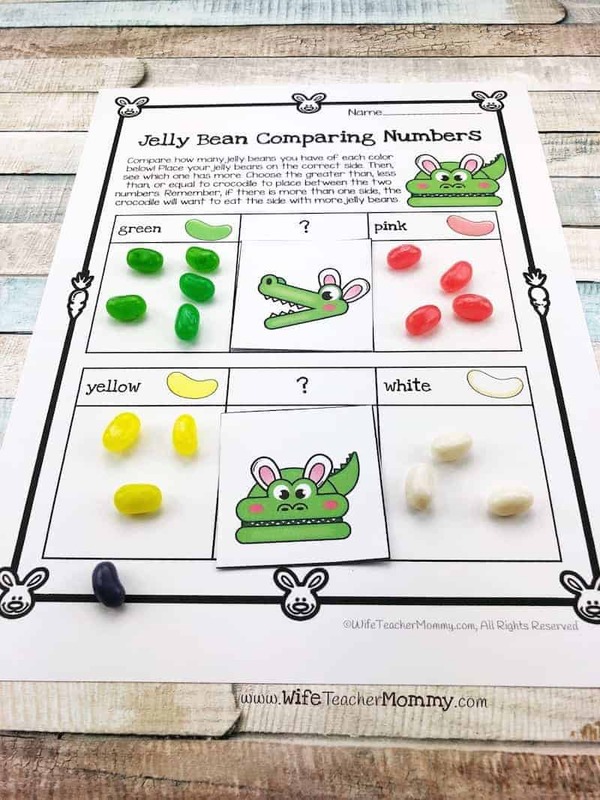 Your students will have a blast with these jelly beans math & more activities. These activities are available for Pre-K through 5th grades! 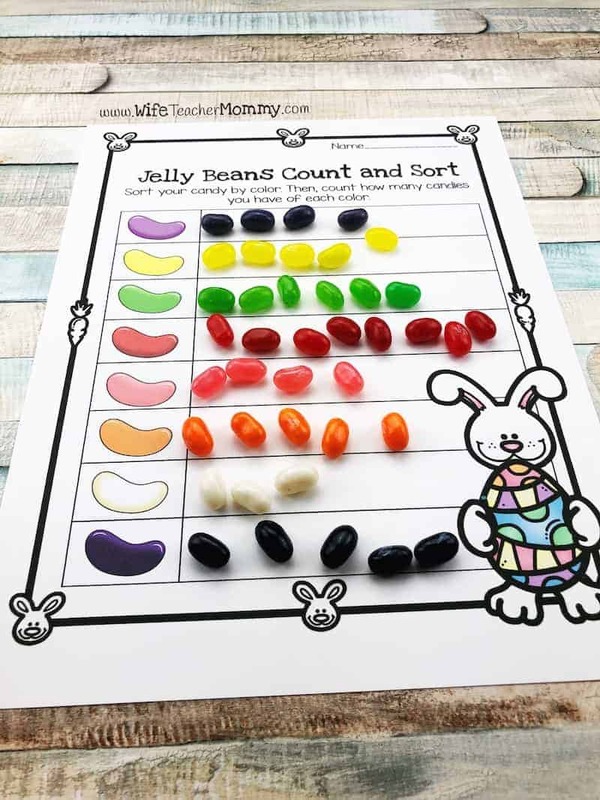 Young students can start by counting and sorting yummy jelly beans by color in the Pre-K through Kindergarten set of activities. Compare numbers with candy in both the 1st-2nd grade sets and Pre-K-Kindergarten sets! Introduce or review graphing by charting the beans on a bar graph. There is a version of graphing in all 3 sets, as well. The Pre-K and K set involves stacking the jelly beans. The 1-2 set allows the kids to color in the bar graph. And the upper elementary one has the students creating the scale, labeling the axes, etc. 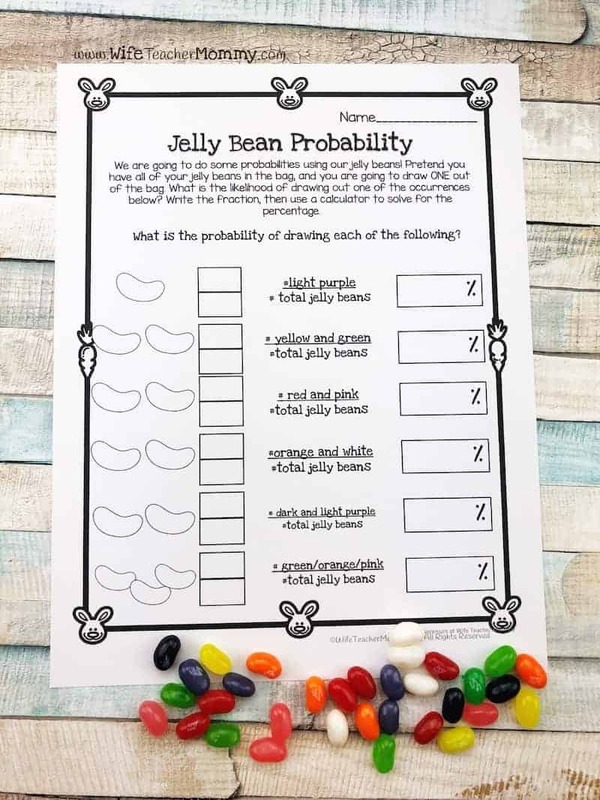 Upper grades will enjoy calculating the probability of drawing of certain colors of jelly beans on the jelly bean probability sheet. They will also do several activities with fractions! All of the activities also include some language arts content. Fill-in the blanks to create a “Bunny Hop” story. Writing lessons included for each age level. Your students will love to integrate art and writing when they design and create their own jelly bean. These easy activities require little prep. Just get some jelly beans, baggies to sort the candies for each child, and enjoy! These activities work perfectly with Brach’s Jelly Beans which include all the colors mentioned in the packet. 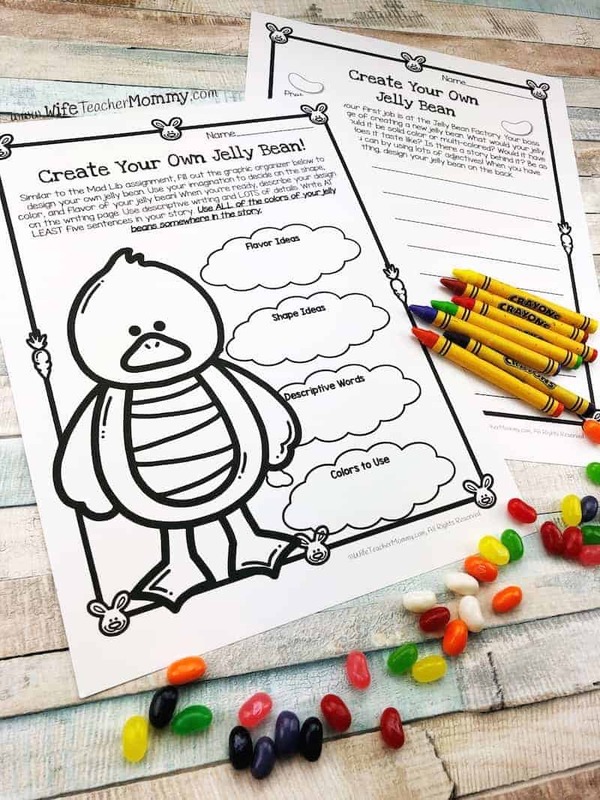 If you have different colors in your jelly beans, you may use the black and white worksheets and have the students color in the colors. Some bunny loves you! Secret writing activities are one of my favorite ways to build community and promote kindness in the classroom. The Some BUNNY is looking out for you Writing activity comes complete with everything you need to have your students find their own bunny buddy and write special notes to each other. Each bundle comes with a story, introductory letter to parents, student name cards, recording sheet (to keep track of who has whom), pre-written student prompts, pre-written reports to teachers prompts, differentiated writing pages, reveal cards, and thank you pages. This Easter teaching idea is ready to go! I don’t know about you, but having dozens of hard-boiled eggs in my classroom to decorate doesn’t sound like a whole lot of fun. 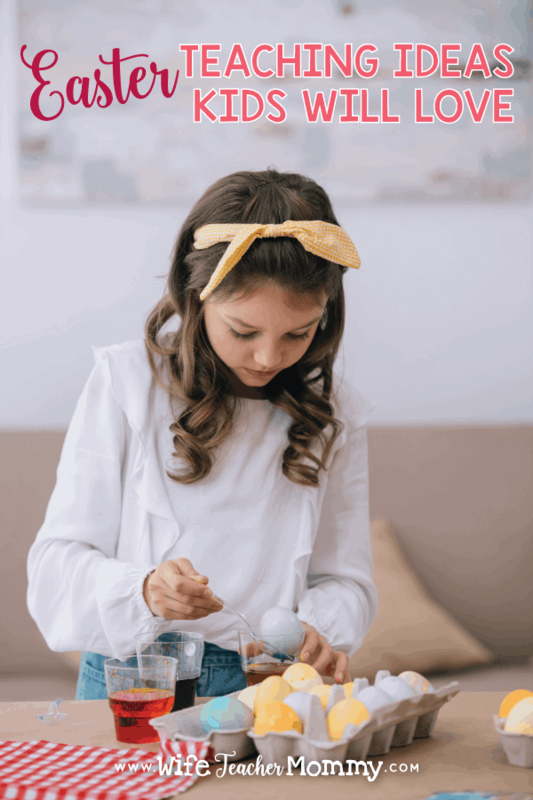 However, decorating eggs is a fun part of Easter that you can make a part of your classroom culture with these simple, affordable styrofoam eggs. Bring out the art supplies and create cute bunnies, abstract eggs, or other cute animals. Have your students take their creations home for a special gift for their parents or guardians, or add another fun event by hiding the eggs in the classroom and having your students hunt them. Each student can go home with an egg in the end. April and May can be busy months. Try out my April and May sub plans, complete with monthly activities for English Language Arts that will help you prepare for a sub or just ease your own planning! Plans are differentiated for kindergarten, 1-2 grades, and 3-5 grades. They are chock full of spring teaching ideas! The lessons for April also contain many Easter activities for your students to enjoy. “My Perfect Easter Egg” writing lesson has students write about how they would decorate their own egg and draw a picture. The May lesson plans include… These spring teaching ideas are so much fun. One thing you will love about these sub plans is that you will receive unlimited lifetime access and and updates. If something gets changed or added, it’s yours! You can also grab ALL of the sets in A Year of Sub Plans Entire Year Bundle. These bundles are available for K-5! Your kids will love this Easter teaching idea! Keep your kids moving with some Easter activities that use coordination and get them out of their seats! This ring toss game game uses two big inflatable bunny ears and rings to toss on the ears. Use this with another activity. Have students review math problems or vocabulary then toss the rings when they get one correct. You can also use the activity as a brain break or indoor recess activity for those days filled with April Showers! It’s Easter time, and your students will be ready to celebrate with bunnies, eggs, and lots of learning. These Easter teaching ideas kids will love are certain to make your springtime planning easy and fun! I love all of these ideas. I have often fooled around with Easter Eggs in the classroom but never jelly beans! I absolutely ADORE the color they add to the worksheets. I cannot wait for April to try these out, and maybe find some allergen friendly beans for my kiddos! Love all of these ideas especially all of the math graphing with jelly beans! 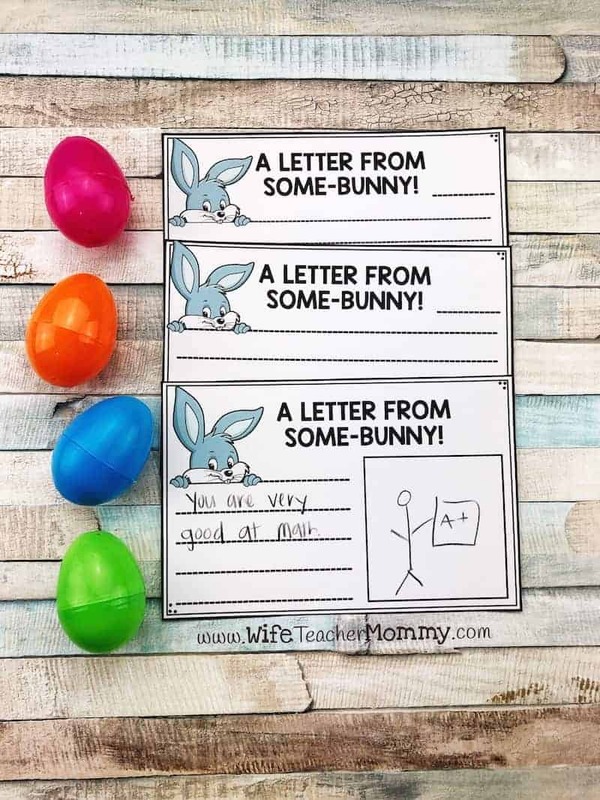 What a great way to teach social skills in the notes from some bunny! I can’t wait to use the jelly bean ideas with my students! These are great ideas!! It’s so hard to always find things the students will love! Glad you like the ideas! Thanks for reading! I love the graphing activity. I’m not a Jelly Bean fan but my students sure are! Yes- the kids always love them! 🙂 Thanks for reading! Not only would this be perfect for my classroom, but my daughter as well! So true! I do the Candy Math & More activities for every holiday with my own kids. They LOVE it! Fun ideas! I appreciate that you have such a wide range of skill levels, from Pre-K to 5th. I’ve used plastic eggs in the classroom for various activities (including hiding them with sight words inside for a literacy egg hunt! ), but haven’t used jelly beans for too many activities. 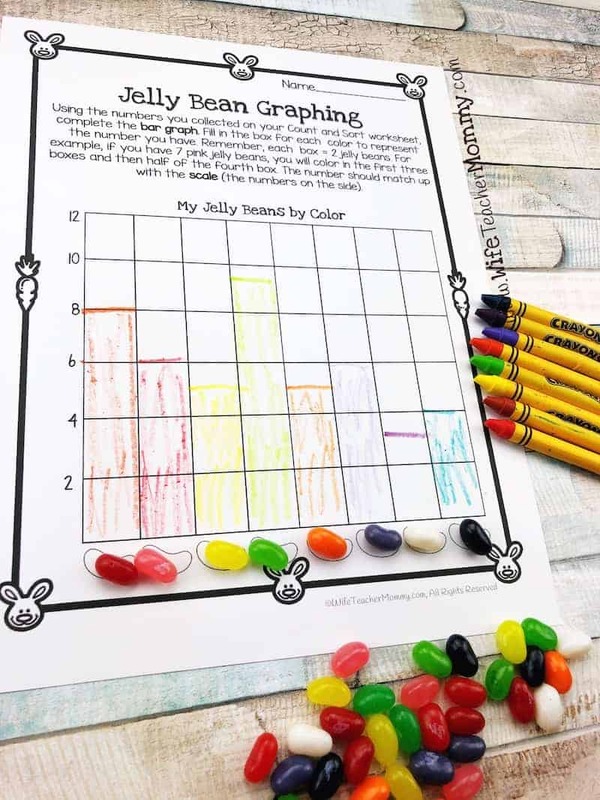 The kiddos enjoy graphing activities with hearts, so I’m sure they will like graphing with jelly beans too! My kids love using the jelly beans just as much as the hearts! I hope they enjoy it. Thanks for reading!